...It is located in a quiet street in the historical center of Leuven, only a few footsteps from the Oude Markt. It is one of the most-talked Italian restaurants in town since a long time. Here you can find a simple and convivial ambience, which is typical in the italian “Osteria” of the old times. Inside Rossi, a low wall separates the kitchen from the hall, which offers a great view over the curiosities in a professional kitchen and the chef in action. Indeed, if you like sharing healthy yet delicious food in good company, discovering new gastronomic map and exciting your jaded palate, Rossi is definitely the place to be. 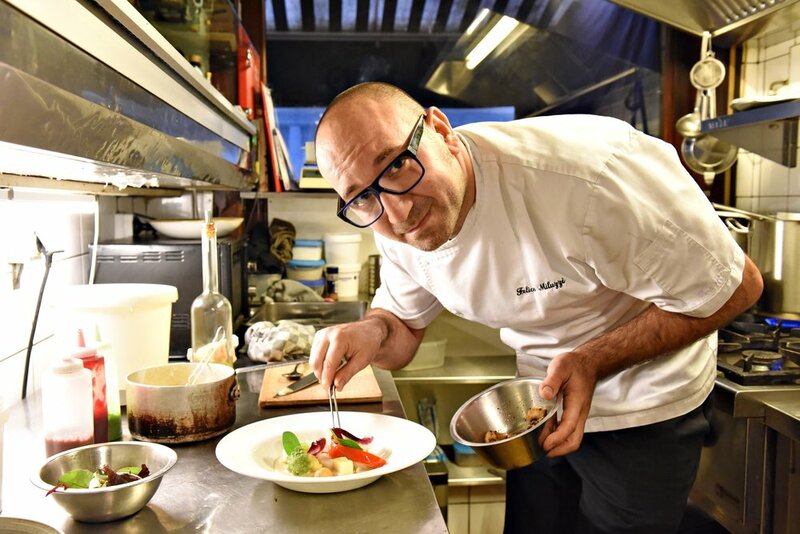 Gault & Millau voted Felice Miluzzi as the best Italian chef in Belgium. "I like to go with the season when it comes to ingredients and use the most fresh and genuine products. I particularly prefer biological products from a selective group of non-mass produced artisanal producers of my beautiful country". Felice was born in Grotti, a tiny agricultural village in the centre of Italy; it is from his family farm that he embarked on his gastronomic journey. Since his childhood, his mother and grandmother Gina, with their unmistakably passion for quality food, taught him how to recognise and appreciate the authentic taste and aroma of his homeland. After five years’ training at Rieti Hospitality Institute, Felice has enriched his experience by working in various starred and non-starred restaurants in Italy. It is during this period that his personal philosophy on cooking was formed, which can be described as - “the luxury of simplicity”: that is to let the main ingredients of the dish sing - be it as basic as potato or the finest fish-- by emphasising their freshness and own characteristics. Today, Felice's cooking style is based upon the traditional regional Italian, with a personal touch and devotion: to convey the happiness to his guests through his delightful and hearty food. My cooking is simple but refined. It is originated from the meticulous study of traditional regional italian recipes wich I then adapted respecting the principals of modern food sience and paying tribute to my own experiences, sensations and memories. I like to go with the season when it comes to ingredients and use the most fresh and genuine products. I particulary prefer biological products from a selective group of non-mass produced artisanal producers of my beautiful country. In addition to the menu à la carte, we propose our speciality : the menu 'suprise' with 3 or 5 courses. A refined succession of tastes, flavors and colors in perfect harmony. BOOK YOUR TABLE ONLINE AND GET IMMEDIATE CONFIRMATION OF YOUR RESERVATION. Ristorante Rossi is in holiday from 16 april till 29 april (included),but our Rossi Atelier is OPEN with ‘chef’s table’ dinner. Online reservation of bel 016884410.